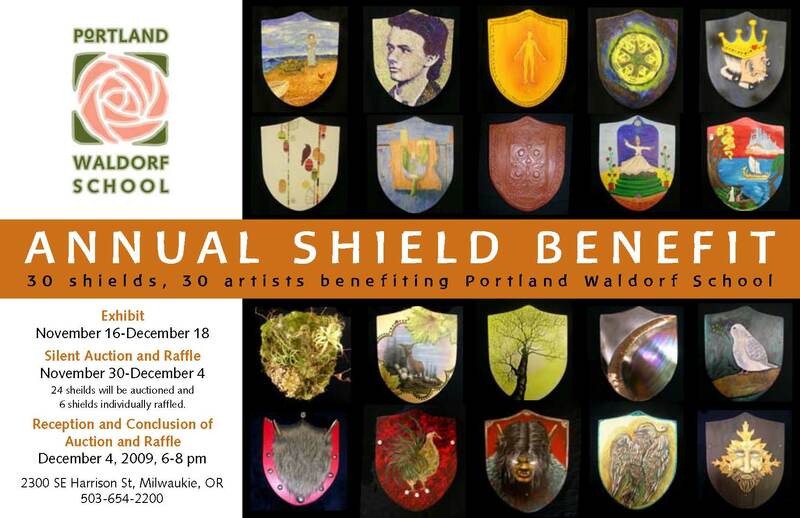 My sister, Anne Mavor, made one of these shields which will be offered in an auction to benefit the Portland Waldorf School in Oregon. Anne’s shield (top row, second from left) is done with encaustic wax, a technique that she’s been learning lately. Anne is a past parent of the school and now works in the office, where she does graphic design, including this very classy auction announcement. Thirty hand-made, blank wooden shields were given to selected artists within the PWS community and the greater Portland area to be decorated through a variety of artistic mediums. They will be exhibited at Portland Waldorf School and auctioned and raffled off from Nov. 30-Dec. 4. This entry was posted in Family by Salley Mavor. Bookmark the permalink. Thanks so much for sharing info about your new blog with me. Just got all caught up 🙂 I’m so excited that you are blogging. You are one of my favorite artists. Not only is your work exquisite… it has soul! Looking forward to getting to “know” you better throughout the next few months!